Christmas festivities bring a noticeable and welcome levity to the work we do. It’s time for fun, happiness and festive frolicking. Oh yes indeed, t’is the season for mirth, merriment and indulgence. It’s time to play spot the vodka luge. So off we jingled to a glorious private party in Surrey,with our freezer van loaded to the max with divine ice sculptures that captured the holiday season vibe perfectly. Our client Polar Black Events (you have to check them out they are specialists in luxury, fashion, lifestyle & brands) organised everything. They started their brief with a cheeky Elf ice sculpture complete with luge (yes you can see exactly where the luge is!) which we happily sculpted for them. 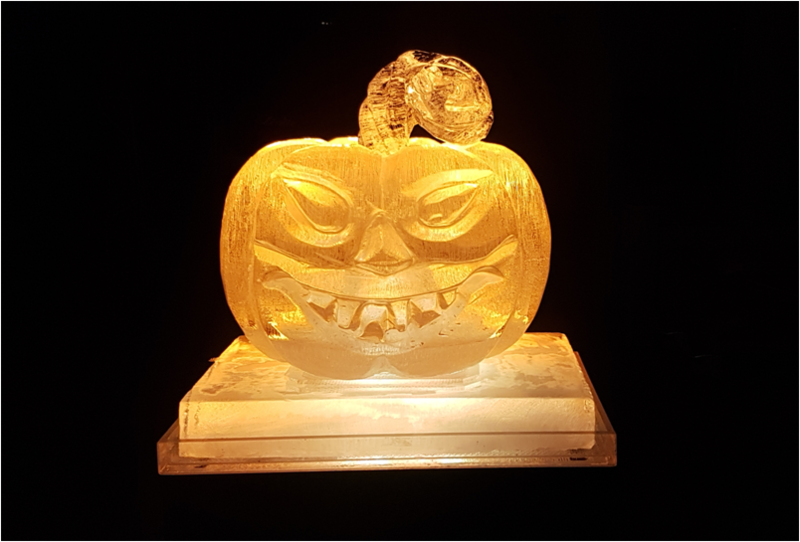 This was such a hit that they promptly ordered a second design – this time a saucy Santa ice sculpture with luge…there’s a theme here as you can see. Very adult and lots of fun to be had watching guests drink from it. Percy was also in residence performing a live ice carving too. Yes – next to a swimming pool. We get all the hard jobs don’t we? Here is Snoopy ‘before’ …. …and here he is after. Now if that was our dog Hugo he’d be straight in the pool! As well as peoples pets (and the occasional sheep) we’ve also carved real-life likenesses of Holly and Philip from ITV’s This Morning,Theresa May and Jeremy Corbyn for the 2015 election as well as TV presenters Kate Garraway and Ben Shepherd from Good Morning Britain. What would you like to see carved in ice?